Villa Fiorenzani is a private villa for rent with swimming pool, WI-FI free and incredible panoramic view over the Siena and San Gimignano hills. Villa Fiorenzani is a Tuscan villa centrally located and makes an excellent rental base for exploring the Tuscany region and the central Italy area...ou can enjoy the real Tuscan experience: city tour, typical food & wine tasting, massage, cooking lesson, horse riding, biking, tennis,trekking, free tennis court.Villa Fiorenzani is a private villa for rent with swimming pool, WI-FI free and incredible panoramic view over the Siena and San Gimignano hills. The isolated and dominant position of the villa on 2500 metres estate of olive groves ensures total privacy and complete tranquillity for a full relax vacation in Italy under the sun of Tuscany. The Villa is within a stone’s throw of the historical centre of Radicondoli, an ancient medieval village that offers all types of services. Villa Fiorenzani for rental is a luxury villa centrally located and makes an excellent rental base for exploring the Tuscany region and the central Italy area. Villa Fiorenzani for rental lies roughly between Siena, San Giminiano, Chianti, San Galgano, Monteriggioni, Florence, Lucca, Pisa and the sea side. Villa Tuscany rental is perfect for a getaway with a group of friends or the family. > 3 doubles bedroom, 2 twins bedrooms, 3 bathrooms, kitchen/dining room, living room. Private Swimming pool, solarium, carpark, laundry, barbecue. You can rent it directly from us, we are the owner, Fiorenzani Family an ancient Tuscan local family. This private, spacious family Villa promises all the sought-after comforts for which Villa Fiorenzani is known. Interiors are country chic. This is the cozy country life. Windows wide open welcoming summer breezes, an afternoon stroll along winding paths. You can rent a professional o symple bike for more days... let us know! Patio with big table and chairs for beautiful dining with incredible view on the Siena hills. We have a Tuscan private chef for your private dinner and / or for cooking lesson with dinner! In Radicondoli it's available a free public tennis court , 1km far from the villa, ou can use it! We totally enjoyed our holiday and were not disappointed in any way. The owners treated us well and made us feel very welcome. We would not hesitate to recommend this villa to any of our friends. uncomfortable and very creaking. The beds upstairs makes quite som enoise and maybe a carpet underneath those beds would make a big difference. The pool was great and was cleaned every morning, we enjoyed it very much. Radicondoli is a true gem, small, beautiful and friendly with fine restaurants (we tried 3 of them, all great), and probably the best pizza in the world at La Pergola (musttry!) We would recommend this place at any time and we hope to come back some day! Thank you also for your suggestion, we will buy a new beds immediatly. We hope to have you in the future! A fantastic place and perfect for our needs. A fantastic place and perfect for our needs. It has been a real pleasure to deal with Ilaria throughout; very welcoming and helpful (especially when booking taxis to restaurants in the August!) The Villa itself was really clean, nicely presented, functional and in a very pretty village. We enjoy the lovely swimming pool with incredible panorama. We would have no hesitation in recommending the Villa as a base to explore Tuscany and we would certainly return in the future. Wonderful private villa with a fabulous pool in the heart of the beautiful, peaceful Tuscan medieval village Radicondoli and countryside. Our hosts were so hospitable, hosting a fantastic welcome. Nothing is too much trouble. Thank you, we will be back. We spent a wonderful time in Fiorenzani's Villa. The place is in the centre of lovely medieval village Radicondoli and near ( 30 minuts by car) to Siena, San Gimignano and Chianti but far enough to perceive the magical atmosphere of Toscana Landscape. The villa is fantastic. Me and myfamily were at home. Garden, house and everything was perfect. La villa ha una vista incredibile da cui si vede tutta la vallata, all'interno è molto spaziosa e luminosa, ben curata, i proprietari sono davvero deliziosi attenti e ci hanno dato ottimi consigli su luoghi da visitare e ristoranti, ci hanno anche organizzato varie visite e degustazioni davvero ottime. Villa Fiorenzani offer many ways to relax and have fun: Rental mountain bikes, swimming, massage, Tuscan cookery courses, photography workshops, free tennis with racket. Villa Fiorenzani provide bed bathroom and kitchen linen changed weekly , private car box, gazebo furnished , barbecue set , service laundry. We take care of all cleaning, pool and garden. maintenance and are on hand to assist you and provide information on tours or itineraries for excursions in the locality, advice on restaurants, inns, wines and wine tasting. 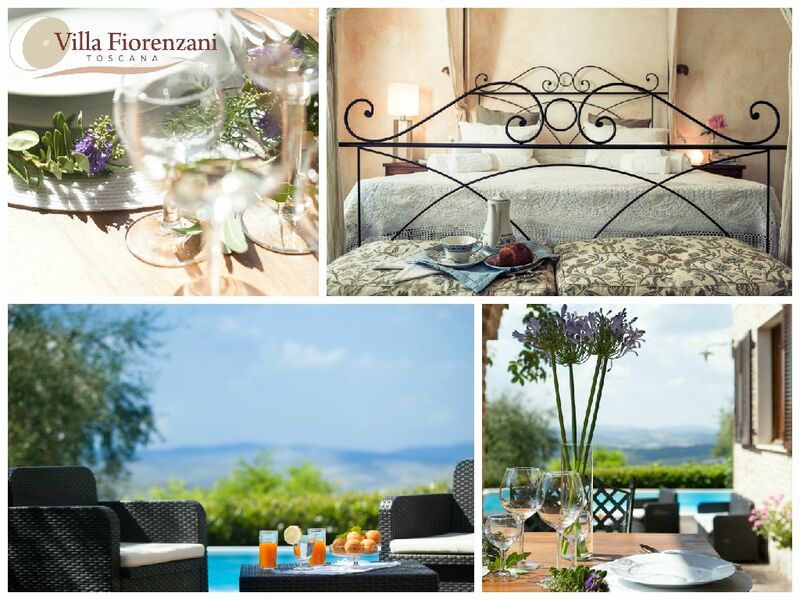 Villa Fiorenzani is located among the sweet rolling hills of the senese countryside, near to Siena, San Gimignano, Florence, Volterra, Monteriggioni, Chianti, Pisa and Grosseto. An hours drive from Florence, Volterra, Arezzo, Pienza, Montepulciano, Montalcino and the seaside.An hour and a half to Lucca, Pisa, Pistoia, Elba Island. In Radicondoli you’ll find has everything you’ll need: restaurants, pizzerias, inns, various shops, tobacconists, newsagent, bank & ATM, post office, chemist’s, doctor’s surgery and much more. Rent prices per ACCOMMODATION ALL INCLUSIVE Prices Include: All taxes 10%, Electricity, Water, Heating, Gas,weekly change of bed linen and bath towels, final cleaning,Garden, Swimming pool, Laundry, Parking . Tariffe scontate in relazione alla durata, contattaci subito! Last miniute & Special Offer every day contact us now!